Cara Delevingne has been bit by the tattoo bug in a big way, starting in 2013 what has proven to be a pretty impressive tattoo collection. Once she got that awesome lion tat inked on her finger in May 2013, she was hooked for life, and, with a best friend like Rihanna, who is famous for her tattoo obsession, we can’t help but think Cara will find herself under the needle many more times in the future. Despite the fact that the British model has received some serious backlash from major fashion houses like Chanel and Burberry over her new-found tattoo addiction, Cara Delevingne’s tattoos just keep on coming, and we can’t say we’re disappointed! Amid rumors that the two may be romantically involved, Cara Delevingne and Johnny Depp’s ex, Amber Heard, hit up Shamrock Social Club on November 5, 2016, where Amber designed a new snake tattoo for Cara – a serpentine skeleton that winds around the outside of the model’s left hand. 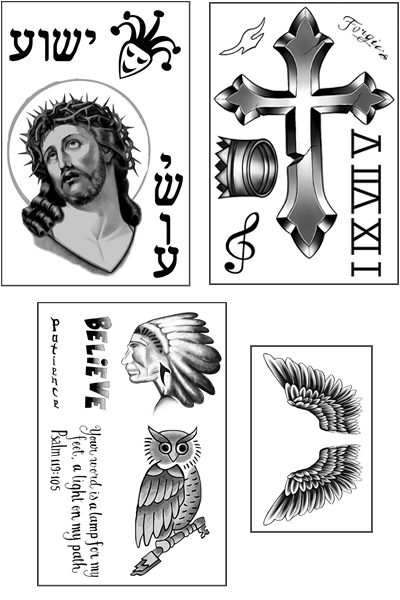 Famed tattoo artist Dr. 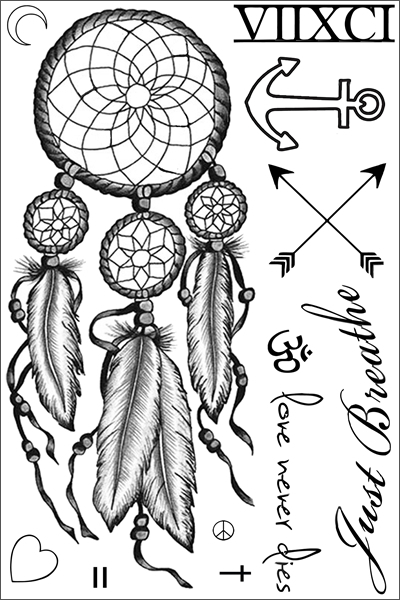 Woo turned Amber’s sketch into a permanent tattoo, Cara’s 27th piece to date. Cara really upped the ante with tattoo number 26, commissioning celebrity tattoo artist Bang Bang to ink a pair of eyes on the back of her neck. Cara’s eyes tattoo is located just above Thai yant tattoo the model debuted at her sister’s wedding in 2014, and has sparked plenty of speculation about the meaning behind the interesting ink. OFollowing the annual Comic-Con event in San Diego on July 21, 2016, Cara Delevingne hit up famed tattoo artist Dr. Woo for a new tattoo of an elephant head on her right forearm, done in the artist’s iconic and delicate “dot and line” technique. On February 28, 2015, Cara Delevingne shared a photo on Instagram of her in the recording studio, hinting at a possible debut album for the British model, and also inadvertently showing off a new “AC” tattoo on her finger. Cara’s “AC” tattoo reportedly stands for the initials of St. Vincent’s Annie Clark, whom the model is rumored to be dating, and is inked on the inside of her left-hand pinky finger in a bold black font. Cara Delevingne showed off another tattoo on January 18, 2015, which features a small coat of arms inked in black and gray on her left ribcage. Cara’s coat of arms tattoo includes a shield with a capital letter “D” inked at the bottom of the shield, and a small crown and pair of wings inked above the coat of arms. At the same time that she debuted her monogrammed coat of arms tattoo, Cara Delevingne also discreetly revealed a tattoo of four white dots inked on her left ribcage, just above the coat of arms. According to Cara, the barely-there white dots tattoo is a tribute to her loved ones, and each dot represents a member of her family, including her parents, Pandora and Charles, and her sisters, Poppy and Chloe. 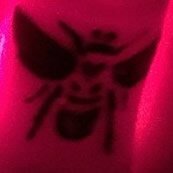 On November 29, 2014, Cara Delevingne took to her Instagram account to show off tattoo number 16, a small black tattoo of a wasp inked on the middle finger of her left hand. Cara’s wasp tattoo appears to have been done over the Thanksgiving holiday, and the ink is sure to add a little extra sting the next time the model decides to flip someone the bird! 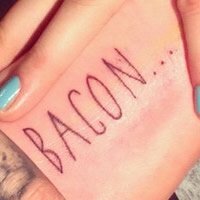 Exactly one year after threatening to get a bacon tattoo back in September 2013, Cara Delevingne followed through with a tattoo reading “BACON…” on the bottom of her right foot. Cara is a self-professed bacon lover – she believes she has a steady relationship with the breakfast staple, and also says bacon is the secret to her fresh-faced beauty. The model commissioned celebrity tattoo artist Keith “Bang Bang” McCurdy to ink her foot tattoo, and she may soon follow it up with a tattoo dedicated to her other favorite food…cheese! 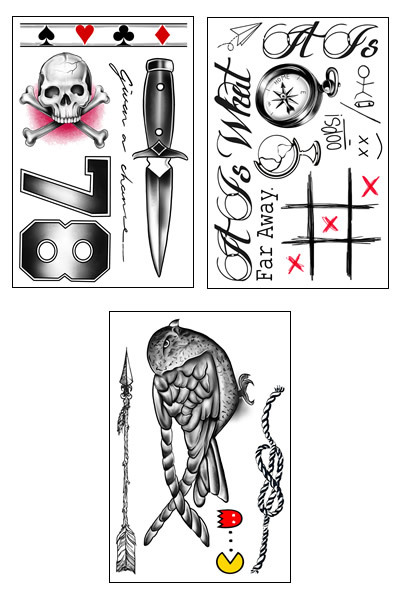 During the same tattoo session that resulted in Cara’s “breathe deep” bicep tattoo, the model also had Bang Bang ink a dove in white on her finger. The dove is an international symbol of peace, but the bird may also represent hope, promise, love or grace. Cara’s dove tattoo could also be a tribute to gal pal Rita Ora, who had Bang Bang ink a pink dove on her shoulder just last year! The week after Cara revealed her matching “DD” hip tattoo with Jourdan Dunn, the British model went under the needle yet again, this time adding a new tattoo to her right bicep. 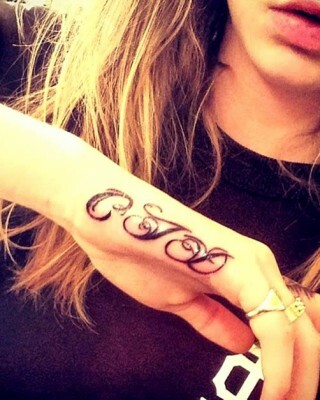 Cara’s arm tattoo reads “breathe deep” and was inked by celebrity tattoo artist Keith “Bang Bang” McCurdy in an elegant white scrolling script. Cara Delevingne and fellow supermodel Jourdan Dunn hit up celebrity tattoo artist Bang Bang on June 9, 2014, for matching “DD” initial tattoos. 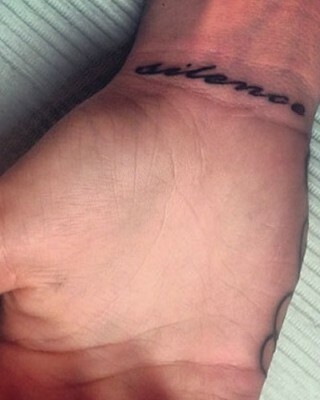 Cara’s “DD” tattoo, which she revealed on Instagram on June 10, is inked on her right hip in a black script font, and signifies what must be a pretty strong friendship with Miss Dunn. During big sister Poppy’s wedding on May 16, Cara Delevingne revealed a brand new tattoo on the back of her neck that is inspired by yantra tattooing, or sak yant, a form of tattooing practiced in Southeast Asian countries like Thailand, Laos and Cambodia. Cara’s neck tattoo is fairly large and is believed to be a magical symbol that bestows on her magical powers, good luck and protection. While spending the Christmas holiday in Barbados with her family, Cara Delevingne showed off a brand new tattoo inked below her breasts. 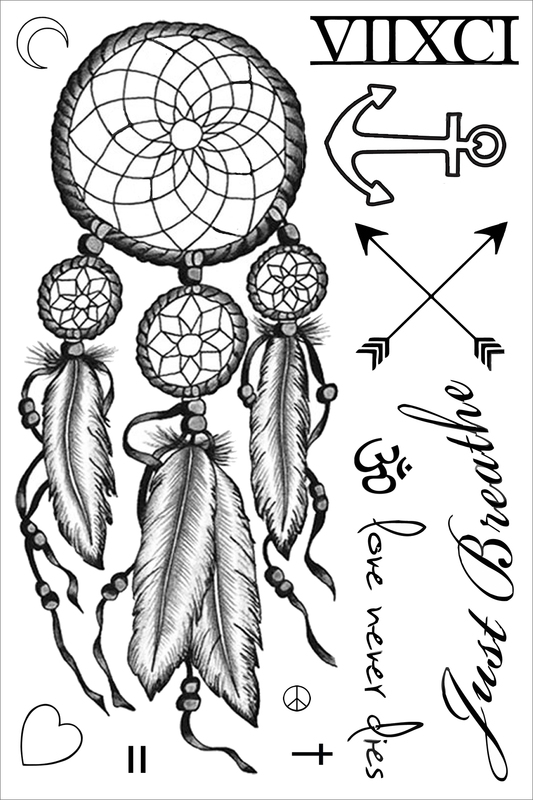 Tattoo number ten for Cara is the mantra and song title “don’t worry, be happy,” which is apparently a quote that serves as inspiration for the young model. 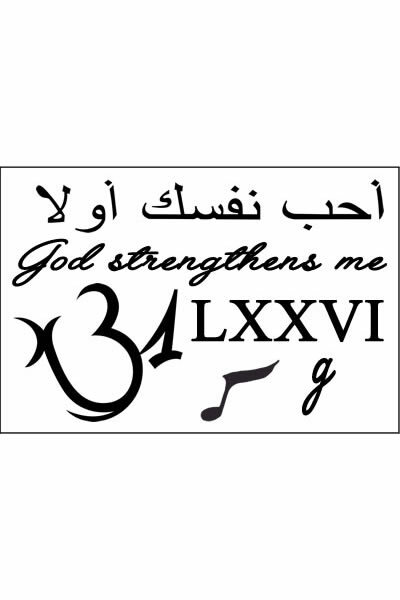 Cara’s chest tattoo is inked in black italics, and features the words “don’t worry” inked below her right breast, and “be happy” inked below her left breast. Back in October 2013, Cara pulled a fast one and had a discreet heart tattoo inked on the pinky finger of her left hand. 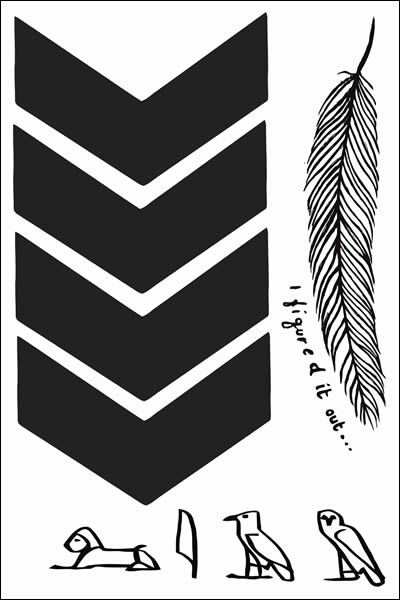 The tattoo, which she has succeeded in keeping pretty much hidden until now, is inked in red and could be a tribute to someone she holds close to her heart. 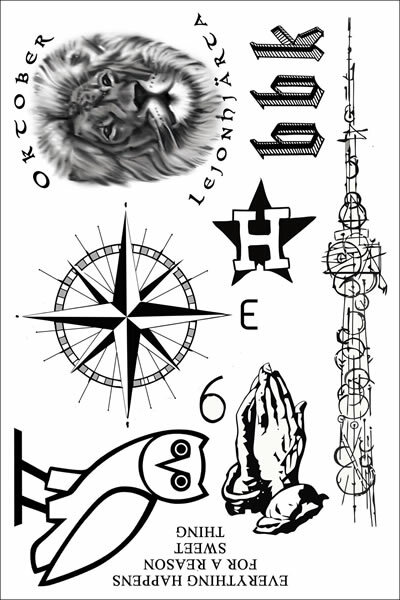 We’re guessing Cara’s heart tattoo was inked by her favorite tattoo artist: Keith “Bang Bang” McCurdy. On October 17, 2013, Cara Delevingne hit the tattoo parlor yet again and added tattoo number 8 – the word “silence” written in script on the inside of her right wrist. 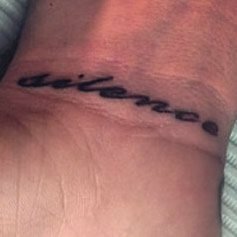 The pic posted of Cara’s “silence” tattoo, which was inked by Bang Bang of course, was accompanied by the caption: “silence speaks when words can’t.” Deep…we think. 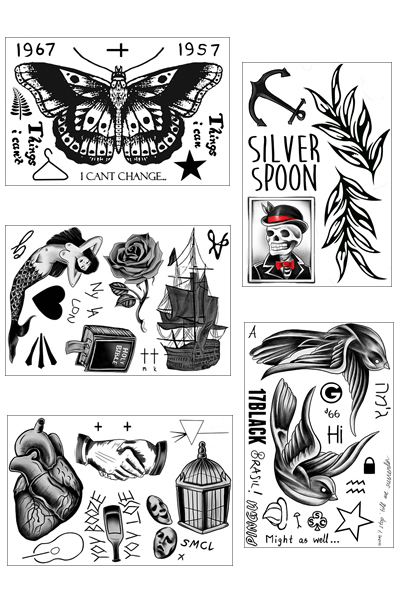 October 2013 was a busy month for Cara Delevingne in the tattoo department! In addition to several other tats inked that same month, the British fashion model discreetly added a small diamond tattoo inside her right ear, near her Southern Cross stars tattoo. It wasn’t until February 2014 however, that the first clear photo of Cara’s diamond tattoo was taken, during a fashion show in London. At the same time that Cara Delevingne got her Roman numeral ribcage tattoo, the model also opted for a unique tat of several black dots encircling her ear, which, together, represent the Southern Cross constellation. Cara Delevingne’s Southern Cross tattoo is inked around her right ear and features five “stars” forming a cross design, which is a symbol of Brazil. Cara Delevingne flew in the face of her disgruntled employers in October 2013, when the model opted for her fifth tattoo – a bold XII (Roman numeral for 12) inked on her right ribcage. Cara Delevingne’s Roman numeral tattoo was inked by Daniel Tucci, a Brazilian tattoo artist, while the fashion model was spending time in Rio de Janeiro, and the ink represents Cara’s lucky number: 12. Cara Delevingne’s first tattoo was inked with BFF Rihanna by her side, but Cara turned to “wifey” Rita Ora when she decided to get inked for the fourth time. In September 2013, Cara went under the needle yet again and had the word “Pandora” inked in black on the inside of her left bicep. Cara Delevingne’s “Pandora” tattoo was done by Bang Bang, yet again, and the mysterious ink stands for her mother’s name. Apparently her initials aren’t the only thing Cara Delevingne associates with her identity, because the British model had the phrase “Made in England” inked on the bottom of her foot two months later. Cara Delevingne’s “Made in England” tattoo was done in July 2013, and is obviously meant to rep her beloved hometown: London, England. Just one week after showing off her cool lion finger tattoo, Cara Jocelyn Delevingne got inked for a second time – this time adding her initials “CJD” to the outside of her right hand. Cara Delevingne’s “CJD” tattoo is inked in black with a fancy script font, and was done by Bang Bang in May 2013. After getting the initials tattoo on her hand, Cara turned the tables on Bang Bang and inked “CJD” inside a heart on the tattoo artist’s leg! Not only was Cara Delevingne’s lion tattoo her first-ever tat, but it was also the moment the British fashion model realized how much she loved getting inked. 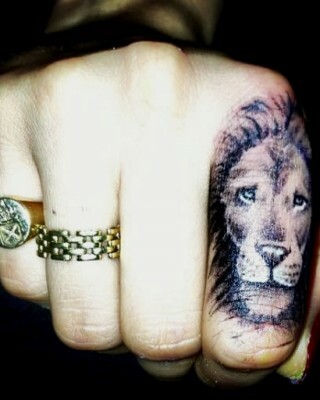 Cara’s tattoo, which was done by the infamous Bang Bang, features the detailed face of a lion inked in black and white on the lower section of her index finger. Since debuting the impressive lion finger tattoo in May 2013, Cara has gone on to add many more tats to her collection, and says she plans on getting “loads” more tattoos in the future. New Mulberry Bag Line Inspired by Cara Delevingne’s Tattoos!